St Patrick was born second half of 4th century, most likely in Scotland or Wales. He is known as the ‘Apostle of Ireland’, our primary patron saint of Ireland along with St Bridgid of Kildare. Early medieval tradition credits him with being the first bishop of Armagh and Primate of Ireland and the founder of Christianity in Ireland. Read more about Star Wars Production Team arrive to a beautiful sunny Donegal this May weekend. Our Donegal Wild Atlantic Way Secret is out! The Wild Atlantic Way has become a popular means to inviting people from all walks of life to experience our rugged and breathtaking scenery that is featured throughout our County! Read more about Our Donegal Wild Atlantic Way Secret is out! the Wild Atlantic Way with some of the most spectacular scenery in Ireland. Spend your annual holidays or a long weekend in Donegal and enjoy the magnificent splendour of Slieve League in the South of the County and the towering majesty of Mount Errigal in Gweedore. Welcome to the Wild Atlantic Way Donegal In Donegal, we have superb scenary - rustic mountains, cliff face walks and miles of Wild Atlantic Coastline! Click on our link to see over 160kms of coastline from Donegal Town to Mount Errigle in Letterkenny. The route follows the much promoted Wild Atlantic Way signs and we have visited some of the 'spectacular' viewing points on the route! The route can be joined from any of our members who are all based in Donegal and approved to Failte Ireland standards. Choose from spectacular scenery on the Wild Atlantic Way or nestled in between our Sliabh Liag Mountains, our accommodation is closeby all routes! From Coastal Walks, looped Walks to Pilgrimage walks or walking festivals to choose from you are spoiled for choice in Donegal! Donegal is a magical experience – come, and enjoy it! County Donegal is the place to visit for a St Patricks Holiday that is something special for everyone with parades in Dunfanaghy, Letterkenny, Donegal Town, Ballyshannon - all on 17th - and Ardara on the 16th March. Enjoy the music and craic and the Northern Lights might even appear to show the magic and uniqueness of Donegal on the Wild Atlantic Way. Donegal Self-Catering Association has launched a new generation website on the anniversary of their 10th year in existence. 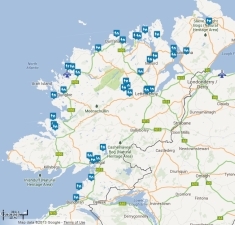 The website www.donegalselfcatering.ie promotes 40 self-catering businesses across county Donegal. All businesses featured on the website are approved by Failte Ireland and meet the standards required. The site is funded under the Rural Development Programme through the Donegal Local Development Company and developed by OSD.